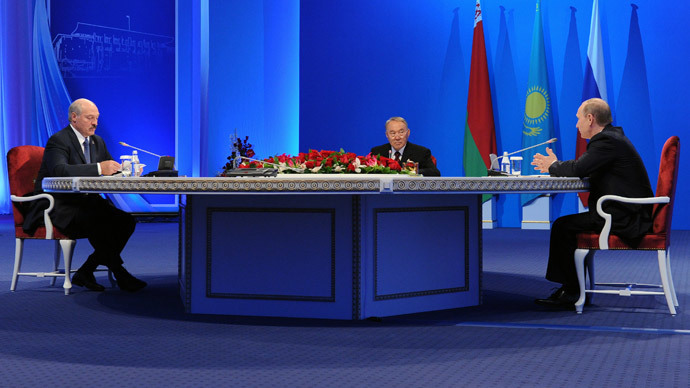 A currency union has become the logical conclusion of establishing a single integrated union of Russia, Kazakhstan and Belarus within the Eurasian Economic Union (EAEU). It will move the Eurasian economy to a new level. The single currency, that will possibly be called altyn, will become the basis for the formation of a single market and perhaps even a single economy. The Russian president Vladimir Putin came up with the proposal of creating the currency union during a working visit to Astana. The Russian leader believes that introduction of the new currency in the next year will help protect the economy of the EAEU. This is not a new idea, however. The initiative of introducing a single currency belongs to the Kazakh President Nursultan Nazarbayev. He spoke about it for the first time in 2003, stressing that it should be a supranational currency of the Customs Union countries – Russia, Belarus and Kazakhstan. Nazarbayev proposed, at that time, to call it altyn. The prototypes of banknotes were developed. But the idea, although it was supported by leaders of the Customs Union, was in fact rather weakly promoted. Moreover, when the agreement was signed to create the EAEU in May 2015, the issue of currency was postponed until 2025 as well as the establishment of an EAEU Central Bank. As it is, leaders are occupied with implementing immediate agreements. By the end of 2015 all the barriers that exist in the goods market should be removed. From 2016 it is expected that a single market for medical devices and drugs will have been created. Issues are being solved in the alcohol market. It is planed that all issues in the energy market will be resolved by 2019. And already since 2025 the single market for oil and gas will be created. The creation of a financial services market is the final stage. An agreement on the creation of a multifunctional body for financial market regulation is only expected to be signed by 2025. And it is only after the completion of all these stages that a single currency can begin to be introduced. So said Saadat Asanseitova, the Director of the Department of Integration of the Eurasion Economic Commission. A single currency ought to boost the totality of the EAEU’s export potential. At the same time, an analyst at IFC Markets Dimitry Lukashev believes that the introduction of altyn is quite feasible. Russia, Belarus and Kazakhstan need it in the first place in order to get away from the dollar and Euro in the payments between each other, for international EAEU payments and financial investment projects. Experts do not exclude that if this matter is taken over by Putin the process of establishing a currency market will be accelerated. However, Kazakhstan has already begun considering the de-dollarization of its economy. This is not, for the moment, about prohibiting the dollar in Kazakhstan. And not only because the population put their savings mainly in US currency. The fact of the matter is that foreign investors are not ready for settlements in another currency instead of the dollar. Nevertheless, the National Bank is developing a specific plan with the government to reduce the dollarization of the economy in 2015-2016. The governor of the National Bank of Kazakhstan, Kairat Kelimbetov, said that the de-dollarization plan of the national economy is based on three main directions. The first direction is providing macroeconomic stability by taking steps to gradually decrease annual inflation. The National Bank calculates that inflation will fall to 3-4% by 2020. The second is the development of electronic payments and reduction of the shadow turnover. The third is the improvement of the tenge’s (national currency) priority over foreign currency. According to Kelimbetov a series of measures is provided: a prohibition on indicating prices for goods, services or work in foreign currency; introducing regulations for making cash payments between individuals for transactions of movable and immovable assets; an increase in deposit guarantees from 5 million tenges to 10 million tenges. Third, a decrease in the savings remuneration rate to 3%. According to Kelimbetov the plan for de-dollarization of the national economy involves launching various regulations for making cash payments between individuals for transactions on movable and immovable assets. These changes, according to the head of the National Bank, will be gradually introduced into legislation over the medium term. In respect to the question: whether Kazakhstan will be able to reject dollar payments completely, Elena Kuzmina, the head of the sector for economic development of the post-Soviet states of the RAS Institute of Economics, thinks that today, for Kazakhstan it is possible to gradually substitute the dollar with other currencies, primarily the yuan. A number of agreements with China were signed either in yuans or require yuan-tenge swaps. Moreover, there is an agreement between the national banks of the two countries. Only, it is not about all currency operations but only a certain volume of currency. Moreover, within the framework of the EAEU, a number of Russian-Kazakh trade and production contracts were signed in roubles or foreign currency swaps. However, the situation with the sharp fall of the Russian rouble has severely impaired the situation for the growth of this trend. “Another process which could be initiated by the Kazakhstan authorities will be directed at depriving the dollar of its function as a parallel currency. Moreover, the only official unit of accounts in the country is the tenge. It will damage the population seriously since they mainly put their savings in dollars. Moreover, according to Kazakh economists, if in 2012 the currency deposits of the population were 38%; then today they are already 45%,” said Elena Kuzmina. Concerning foreign trade, Kazakhstan’s main export commodity is hydrocarbons which are tied to the dollar in the world market. Perhaps when they are sold to China this could be done with the national currency. But Kazakhstan not only trades hydrocarbons with China but also with Europe, Iran and Russia. And most of the industrial goods and technology they buy from the West. 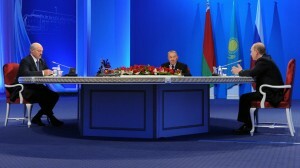 Most likely, the Kazakh authorities can, and will, pursue de-dollarization policies, as this will contribute to the strengthening of the national economy, and in doing so will help China and the EAEU (provided that this union will purposefully handle those economic issues that were declared in the Treaty on the EAEU). But doing this quickly, and even more so all at once, is not possible and unwise (the dollar is still, for now, the world’s leading currency). Elena Kuzmina noted that de-dollarization is gradually becoming a world trend. “It is not an independent initiative by Kazakhstan or any other country which promotes or leads de-dollarization policy,” said the economist. Kazakh parliamentarians are divided on this issue. Some are convinced that: Kazakhstan needs to reject mutual dollar and Euro payments by all means. Deputies have calculated that: one $100 bill costs only 14 cents. This means that countries which settle their accounts in American currency are working for the economy of one country only: the USA.